Looking for a way to stir up your students’ enthusiasm for biology? This collection of Sea Secrets PowerPoint presentations is designed to kindle a passion for the sea and her creatures through a greater understanding of their complexity and cunning. These beautifully illustrated programs were crafted as “edutainment” for cruise ship audiences, so are inspiring, fun, and painstakingly accurate. There is no charge for the presentations. Offering them helps keep my skills honed between cruises, role models (a female’s) enthusiasm for science, and promotes environmentalism. I am a travel writer, author, and speaker with 20 years experience in science education. In various instructional positions, I’ve shared scientific wonders with students from preschool through college. My lectures have won fans on cruise ships and in other venues for over fifteen years. 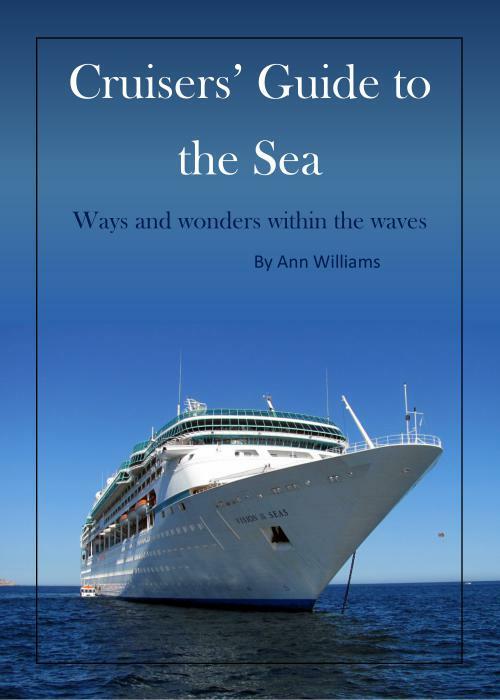 To find impelling material for my latest work: Cruisers’ Guide to the Sea, I am participating in oceanic missions, volunteering at the Denver aquarium, and interviewing researchers, naturalists, and other experts. My findings and experiences add considerable color and depth to my presentations as well. *To assist with lesson planning, I have included numbers to indicate the CDE Academic Standards illustrated in each lecture. -Why baleen is key in classifying whales and enabling their immense size. -Why whales swim the furthest, sing the loudest, dive the deepest, grow the most magical teeth, and steal more shows than any other creature on earth. Dolphins: What Are They Thinking? -Discusses various indicators of dolphin intelligence including: brain size, sonar capability, mirror recognition, tool usage, empathetic behavior, communication, and teaching/culture. -Repeatedly reinforces the need for rigorous proof in scientific conclusions. -Touches on dolphin behaviors such as feeding, mating, parenting, and cooperation with pod members as well as other species. -Shares some personal experiences assisting in dolphin research. Each diatom is a single golden-green plant cell encased in glitzy glass. Dinoflagellates luminesce when disturbed by a vessel or swimmer. Sea slugs are beautiful, tough, toxic, and may help cure cancer. Coral reefs synchronize their release of eggs and sperm to regenerate the reef. Seahorse couples share a daily courtship dance, complete with passionate color changes and humming serenade. Octopus neuron numbers are close to those of dogs, and their body’s trick bag rivals Merlin’s. Sea turtles navigate great coast to coast migrations—if they don’t choke on a plastic bag or drown in a fishing net. Fortunately, sea saving is the crusade of our era. Children, teens, parents, and elders are cleaning up, inventing, defending, studying, and campaigning to fight threats on every front. The best loved sea birds: penguins, puffins, and albatrosses; all specialize in heroic parenting. Otters use super-sensitive whiskers to track prey by following a trail of disturbed water. They protect a vital ecosystem by consuming 25-30% of their body weight daily. Seals inspired siren-type lore which enlivens an overview of such seal traits as the difference between sea lions and true seals, secrets behind their exceptional diving abilities, as well as descriptions of elephant seal mating behaviors and catastrophic molt. Often torturous difficulties involved in breeding and parenting point up the vital role of hormones in passing the torch of life through the ages. Strange phenomena terrorized early sea voyagers, including the flickering plasma dubbed Saint Elmo’s Fire and mirages caused by temperature inversions. Many sea monster sightings can be attributed to basking sharks which are the second largest fish in the sea. Toothed suckers, powerful arms, and piercing beaks made colossal, giant, and even jumbo squid nearly as horrifying as the mythic Kraken. Sharks marshal their acute senses, speed, and wicked teeth into the perfect predatory storm. Still, the horrors wrought by rogue fishing nets make all those other hair raisers look mild. -Considers bizarre feeding habits, defensive tactics, and some mating habits of anglerfish, hagfish, sea stars, sea cucumbers, pearlfish, horseshoe crabs, sea jellies, lobsters, moray eels, and stingrays. -Conclusion discusses the importance and difficulties of sea research, reinforced by examples from my shark tagging experiences. While this program focuses on the geology of the seafloor, seafloor spreading, and hydrothermal vents; it deals with several biological concepts, especially solar-based and chemical-based food chains. The weird life forms vents’ opened doors to major advances in gene splitting, the discovery of microbes growing in Earth’s crust, and the realization that first life was likely formed in undersea hot springs. The continental shelves are vital as a habitat for the vast majority of sea life and a repository of natural history. Presentation times run about 40 minutes but can be tailored to your needs. References and/or scripts available on request. Please contact Ann for more information or to schedule a presentation.